For decades before the Civil War, Southern states enjoyed a majority in the U.S. Senate and Supreme Court. This helped slave states maintain the institution of slavery nationwide even as the more populous Northern states were abolishing it within their borders. Following the Mexican-American War in 1848, the United States acquired vast Western territory. Although Southern states initially celebrated the victory, they quickly came to view the new territory as a threat to the institution of slavery. If the new territories became free states the South would no longer maintain its majority in the Senate or Supreme Court, and it would be only a matter of time before slavery was abolished nationally. To remedy their problem the South supported invading Cuba, Mexico, and Central America then annexing those territories to establish more slave states. Unable to secure Congressional support for these invasions, Southerners privately funded expedition and invasion forces and sent them off with much fanfare, but they all ended in miserable failure. The invaders were either forced to retreat, imprisoned, or executed. On April 16, 1862, the Confederate government in Richmond passed the Conscription Act, which made all white males between the age of 18 and 35 eligible for a military draft. This was the first draft in American history, and was extraordinarily unpopular. Adding to the South’s social unrest was the Twenty-Slave Law, passed in October 1862, which exempted owners of 20 or more slaves from military service. Supporters of the law said it was necessary to prevent a slave revolt after Lincoln issued the Emancipation Proclamation on September 22, 1862. Critics said it proved the secession was a “rich man’s war” to protect the interests of slaveholding plantation owners. For decades, the United States government fought and forcibly relocated Native American tribes. With the outbreak of war, some Native Americans saw an opportunity for better treaties with the Confederacy. This included Cherokee, Choctaw, Chickasaw, Creek, and Seminole joining an 1862 Confederate raid into Union-controlled Missouri. The Native Americans hoped to gain more independence. Ironically, it was mainly Southern military commanders who fought against Native Americans in the years before the Civil War. The raid ended with Native American forces scattering after coming under Union artillery fire, and Confederate forces retreating after being cut off from their ammunition wagons. Early in the war the Confederate government made a decision to pay for the war effort by printing money. Combined with a Union blockade that made many goods scarce, inflation quickly became rampant in the South. In some places the cost of a bag of salt went from $2 in 1861 to $60 the following year. The price of goods rose 10 to 15 percent every month. Southern newspapers and politicians sought a scapegoat for the problem, and condemned “Yankees and Jews” for extortion. Jewish merchants were likened to “vampires” who were leeching Southern wealth. The reality was that all Southern merchants were raising prices in response to inflation, and made very little, if any, profit on what they sold. In the North, the Union military struggled to enforce the blockade of Southern trade. Despite the war, trade continued between North and South. Cotton went North; food and supplies went South. These black market supplies kept Confederate armies in the field, that might have otherwise been forced to give up the fight. Union Generals Sherman and Grant tried to halt the illicit trade. Frustrated by porous border in Memphis, Grant issued the following order on December 17, 1862: “The Jews, as a class, violating every regulation of trade established by the Treasury Department, and also Department orders, are hereby expelled from the Department.” Lincoln rescinded the order saying that Grant should focus on dishonest traders and not a whole class of people, “some of whom are fighting in our ranks.” Grant said nothing more about Jews. In 1862, with the Confederacy winning battles and the Union army struggling, anti-war Democrats scored state legislative electoral victories in the western states of Illinois and Indiana. To counter the anti-war movement, Indiana’s governor convinced Republican legislators to avoid the legislature for 2 years. This prevented the Democrats from having a quorum, and thus could not legislate. The state operated without a typical budget during this time. The governor took out loans and received support from the federal government to keep the state running. On May 5, 1863, Clement Vallandigham, Democratic candidate for governor in Ohio, gave a provocative speech against the war. He declared Lincoln a despot, criticized the Emancipation Proclamation, and advocated for armistice. He was arrested by the U.S. military, and convicted by a military court for violating General Ambrose Burnside’s General Order Number 38 for “acts for the benefit of the enemies of our country.” The order was vague and the conviction was controversial. Spared the firing squad Vallandigham was exiled to the South. From there he traveled to the Canadian border with Ohio and continued his gubernatorial campaign. Vallandigham lost the campaign, receiving just 39% of the vote. Sherman’s March in 1864 is etched into Southern memory of the war. Sixty thousand Union soldiers looted or destroyed all property in their path from Atlanta to Savannah, but throughout the war Confederate troops had done more damage to Southern civilians. Sherman’s March is noteable in part because it was rare to Union armies to abandon their supply lines and live off the land. Union troops were well supplied compared to their Confederate counterparts. Union engineers were famous for the speed with which they could build bridges and rail lines to support the front. On the other side, Confederate troops were forced to live off the land early in the war as a matter of survival, and that meant taking what they needed from Southern and border-state civilians living in the war zone who were reimbursed with worthless Confederate notes. It has been estimated that Confederate troops looted $500 million from their own citizens. After the war the Confederate commandant of Andersonville, Captain Heinrich Hartmann Wirz, was tried and executed for murder by a Union military commission. It is still a point of debate of whether Wirz was just a scapegoat or the cause of the camp’s inhumane conditions. The South could barely feed its own citizens and soldiers, let alone Union POWs. In 1909, the United Daughters of the Confederacy erected a monument in Andersonville as a memorial to Captain Wirz. A Georgia newspaper declared Wirz’s trial and execution were “an illegal court martial.” The National Park Service said The Wirz Monument was met with condemnation and protests in the North, and has been the target of vandalism. The Wirz memorial still stands in Andersonville today. 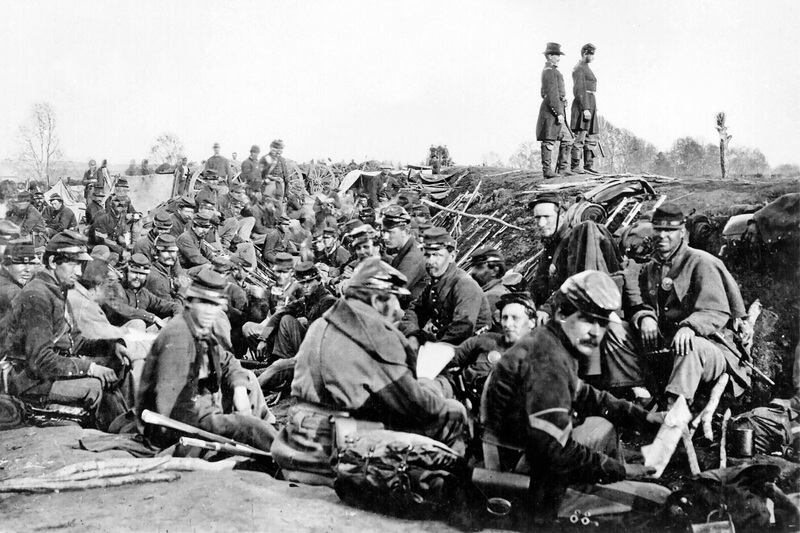 Cover Photo: Union soldiers entrenched along the west bank of the Rappahannock River at Fredericksburg in the Battle of Chancellorsville, May 1863. From the National Archives. South Philly communications professional passionate about good government, sustainable communities, better health care, fair elections, and local history.